Crispin Porter & Bogusky, in follow-up to hits like the subservient chicken and creepy king figure, has launched another viral cross-platform classic for Burger King with The Truth About Tony. The idea behind the campaign, is to see if Tony Stewart really loves the BK Whopper he endorses, by webcasting a lie detector test on October 20th. The campaign works because it hits at a classic stereotype: celebrities get paid to pitch, not necessarily use or love our products. Similarly, do we or should we, expect that properties "love" the products and services that sponsor them? Do we hold the property/sponsor dynamic to the same threshold as the celeb endorsement? All else being equal we expect that properties will use the products that sponsor them out of obligation, but at the end of the day most consumers, like in the case of celebrity endorsements, realize it's a business relationship rather than a genuine affinity. The veil of this pleasant illusion is removed every time we see turnover in the same classic categories, isn't it? 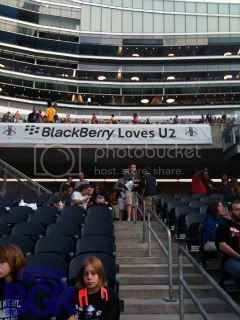 Do we really believe that "Blackberry loves U2." Doesn't it love them because it sees a valuable marketing opportunity? Does U2 now love Blackberry more than Apple, or did they simply present a better offer than their former business partner? I'm not advocating a polygraph, but maybe we should simply be a little more honest with our audiences (and ourselves). Rather than spending precious resources trying to convince audiences of a fading illusion, maybe we should focus on business goals, and how we'll use a better consumer/fan/attendee experience, to meet them.